Punnett's Square: Why Do Some Finches Have Large Beaks While Others Have Small Ones? Why Do Some Finches Have Large Beaks While Others Have Small Ones? Cameroonian finches have always had either a large beak size, or smaller beaks. This had always been thought to be due to a difference in how hard the seeds they eat, much like the theory of Darwin's finches. However, birder and biologist Tom Smith, investigated this further by establishing a breeding colony of these finches. Based on the results, the trait seemed to be due to Mendelian genetics, and the larger beak was the dominant trait, with a 3:1 ratio of large to small beaks. This was the stepping stone to figuring out which genes affected this trait, and with the help of Bridgett vonHoldt, Princeton biologist, the question was solved. She found a stretch of DNA with 300,000 base pairs that always seemed to vary between the large and small-beaked finches, with the gene IFG-1 in the center. This gene is a growth-factor gene. vonHoldt said that this is a gene she has studied in canines as well and that if it is changed how it is expressed, a normal-sized dog could be changed into a dwarf-sized dog. 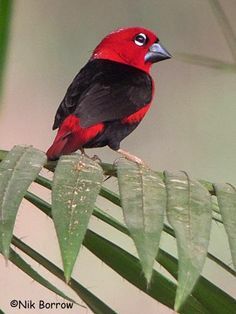 This being said, not only can he gene affect the whole animal, but a specific trait as well, which is present in the case of the finches and their beak size. This all depends on where the gene is located on the genome and where it gets expressed, says vonHoldt. This makes me wonder whether it is possible in the future that a human or animal's size can be controlled and predetermined by alternating these specific genes. I am curious to see whether large or small beaks provide any advantage to these finches in their Cameroonian environment. If so, I wonder if one trait has evolved be more prevalent among the population as Darwin saw with different animals adapting to specific niches in Galapagos. I found this very interesting simply because I love birds. I was unaware of the fact that genes it could not only affect the whole animal but specific traits the animal has such as beak size.